Barely hours ahead of Samsung’s Galaxy Note Unpacked 2016 event, new leaked live images have surfaced on the Internet showing the upcoming Galaxy Note 7 in its full glory. 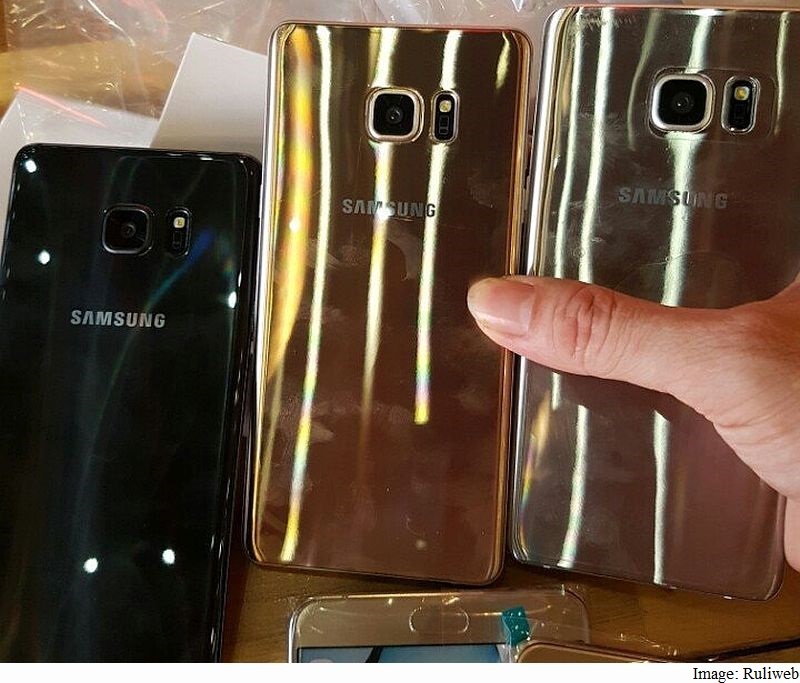 The leaked images show the Galaxy Note 7 purportedly in three colours Onyx, Gold, and Silver Titanium. The leaked images also indicate that the Samsung Galaxy Note 7 will sport a dual-edge display, as rumoured previously. The leaked image of the Galaxy Note 7’s bottom panel shows single firing speakers, a USB Type-C charging port, and a 3.5mm audio jack. The bottom panel is also seen holding the S Pen, a highlight of the Note series. In one of the images, the screen is lit with the Galaxy Note 7 appearing on the screen looking like a lock screen. Another leaked image also shows the retail box of the Galaxy Note 7 with details about the innards. Notably, most of the innards seen in the image corroborates to the earlier leaks. The leaked live images of the Galaxy Note 7 have been posted by Ruliweb blog. One of the biggest highlights of the new Galaxy Note 7 is said to be the iris scanner which is expected to debut on the new Note device from Samsung. As for specifications, the Samsung Galaxy Note 7 is expected to include IP68 certification for dust and water resistance; Android 6.0.1 Marshmallow; a 5.8-inch or 5.7-inch QHD Super Amoled display with Gorilla Glass 5 protection; a Qualcomm Snapdragon 821 or Exynos 8893 SoC (depending on the region); 6GB or 4GB of RAM; three inbuilt storage variants – 64GB, 128GB, and 256GB; storage expandability via microSD card (up to 256GB); USB Type-C port; a 12-megapixel rear camera and 5-megapixel front-facing camera, both featuring Dual Pixel technology for better low-light photography, as well as a 3500mAh or 3600mAh battery with fast charging capabilities.